fridays in fall: yummy fall recipes! Happy Friday everyone! I can’t believe it’s already mid-October and the holidays are just right around the corner! I absolutely love all things fall, so I’ve really enjoyed this Friday series for the blog. The past couple of ‘Fridays in Fall’ posts have been about fashion and then we took a quick break to talk about my marathon training (see that post here), but today we wanted to take things in a little different direction. Martha and I both really love cooking and exploring new recipes to try, so today we’re sharing a few yummy fall recipes we’re eager to start making! Okay is it just me or does food taste better when it’s pretty? This salad not only sounds delicious, but all the colors and textures make it look so good too! This would be perfect as a side for Thanksgiving or even as a weeknight dinner. 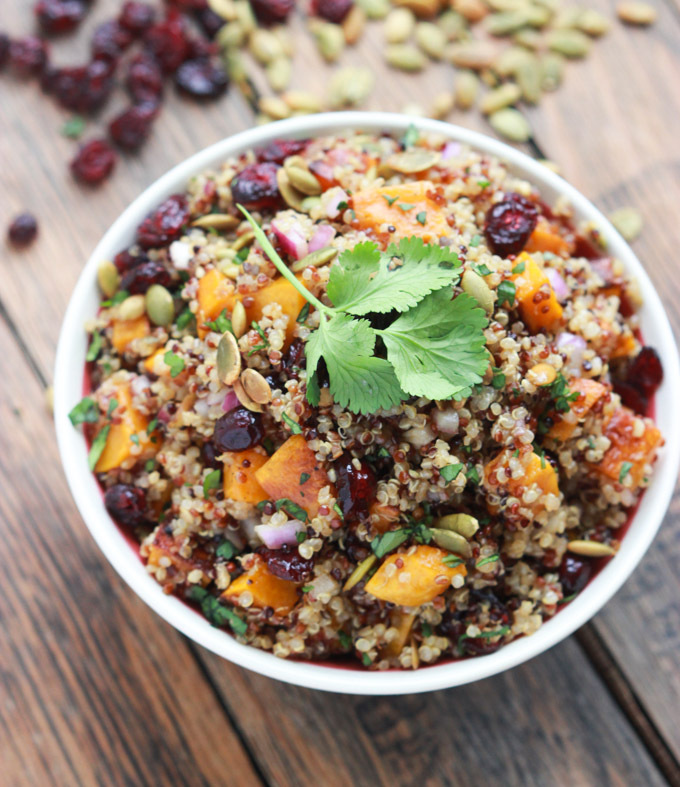 Roasted butternut squash is such a delicious fall food, and quinoa is a great source of protein. If you want to make it a little more hearty for dinner, you can add grilled chicken. The cranberries and vinaigrette dressing add the perfect touch of sweetness too! so Martha swears by this recipe and I can definitely see why. 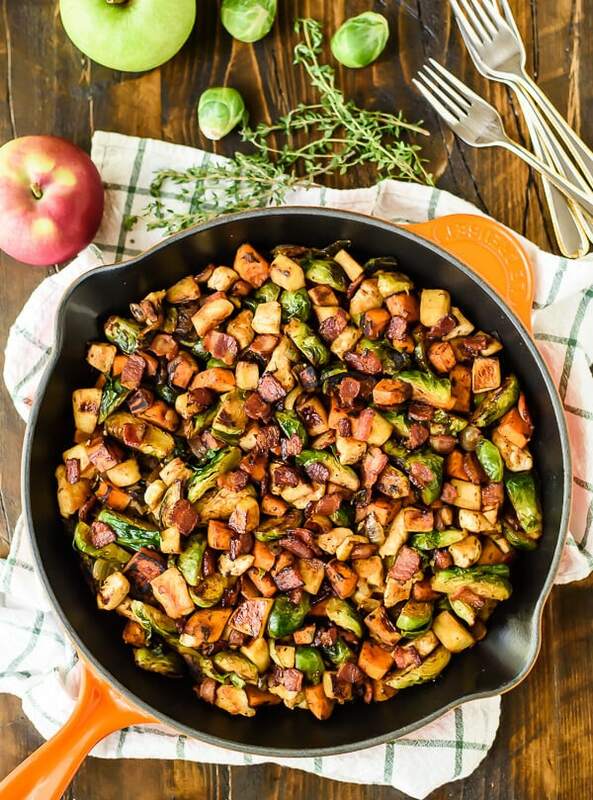 It has so many tasty ingredients from brussels sprouts (obsessed!) to cinnamon and apples – YUM! it’s a pretty clean recipe and incorporates lean protein, fruit, and veggies. it’s perfect for a weeknight in or if you’re hosting people and want to serve a fun, fall meal. or if you’re just looking for a Thanksgiving or potluck side dish, you could easily just make the veggies and cut out the chicken for a lighter dish! okay so I know most of y’all already know this, but I am a serious breakfast lover. I am usually pretty simple and literally never get tired of some sort of scramble/omelette, but sometimes it’s fun to change it up. 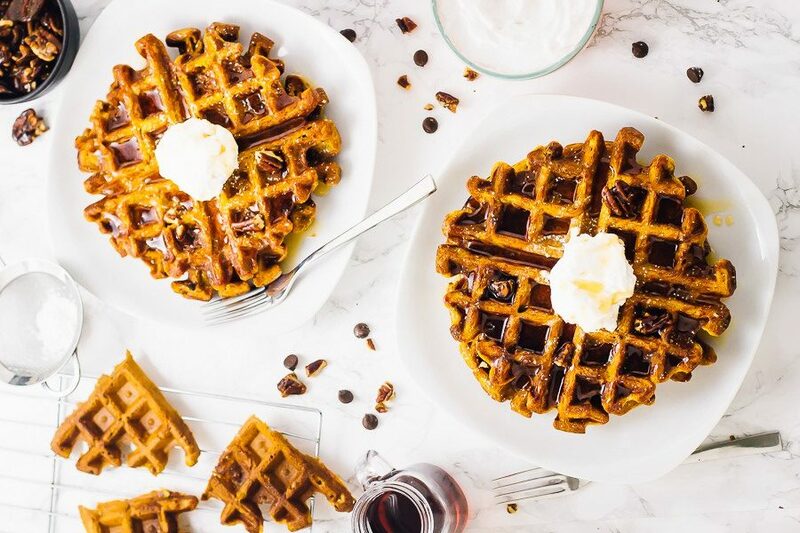 how amazing do these pumpkin waffles look?! these are perfect if you’re having a sweet tooth and don’t want to get too carried away (these are pretty clean as far as waffles go!) or if you may be have friends staying with you for the weekend, these would be a fun breakfast option! guysss look how pretty this dish is! I legit may be bringing this to Thanksgiving this year. 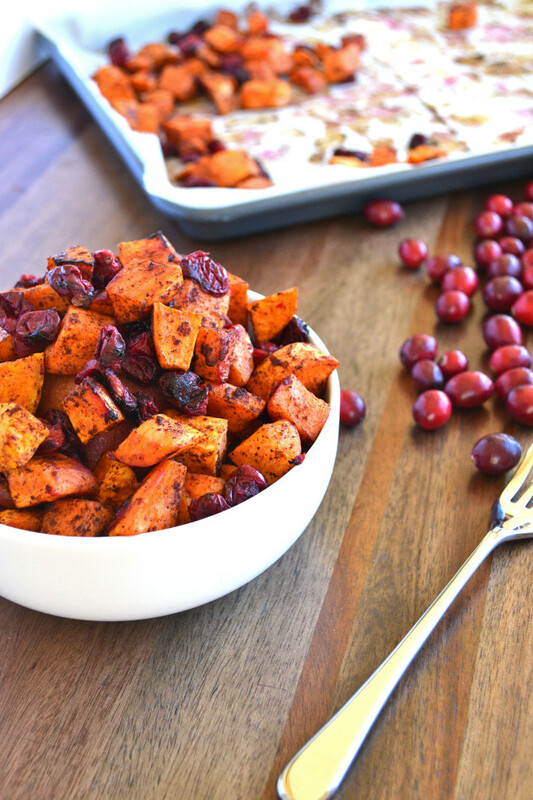 Roasted sweet potatoes are already so tasty, but I’m sure the spice of the cinnamon and the sweetness of the cranberries just make it even better! Plus, it’s such a clean snack and a good source of healthy carbs. Seriously, I might just need to make this over the weekend because it just looks THAT good! this may be the most adorable dessert I have ever seen! 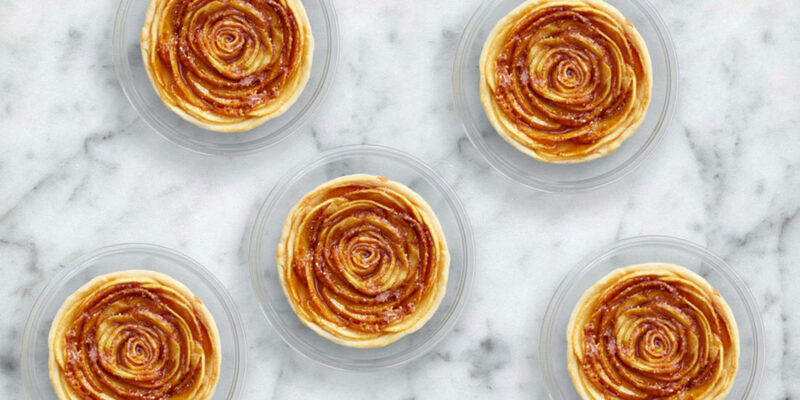 these yummy apple tarts look like little roses and I just love it! They’re great individual desserts to serve at a holiday party or even bring into the office for a little treat. Obviously, these aren’t necessarily considered ‘clean eating’ but we love dessert and think these are just too cute to pass up! hope you enjoyed this week’s Friday’s in Fall post! For more cooking inspo, be sure to follow me on Pinterest (@laurenkaysims)! Do you have any favorite fall recipes or go-to dishes for Thanksgiving? Share yours using the #LKSfridaysinfall – we’d love to see what you’re cooking or if you try any of the recipes we mentioned today! Thanks for all these! Love that they have good ingredients. I love all the sweet potatoes!! Fall food is my favorite. me too! so many delicious flavors! These look so good – fall comfort food is the BEST! Could you include links to the recipes so we can easily access them? Thanks!